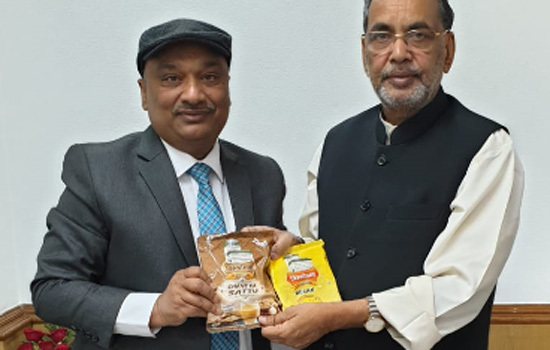 Ever since he proved the worth of Biscomaun in providing urea to the poor farmers in the state of Bihar, its Chairman Dr Sunil Kumar Singh has been on cloud nine. Currently he is in Delhi meeting everybody from the Union minister to the top officials. “Met the Union Minister Radha Mohan Singh and briefed him about our activities”, said Singh in one of the WhatsApp messages sent to Indian Cooperative. Besides the urea, there are several other things we are doing, he added. It bears recall that Biscomaun has been producing kachchi ghani mustard oil and selling it under its brand name. It also ventured into the business of pure honey. “But now we have diversified into sattu, besan, achar and sella rice”, said the Chairman. I briefed the minister about all these, said Sunil who claims to enjoy personal equation with the minister despite belonging to a politically different party. Readers may know that Sunil swears by Lalu Yadav and calls him his guardian. “These new activities are primarily aimed at helping the woman folk of the state. We have raised a network of such women who have plunged headlong into the job”, said Sunil adding that the Union Minister was very happy with Biscomaun’s activities. Sunil also used the occasion to tell the minister about Biscomaun’s efforts to make Bihar a polythene-free state. 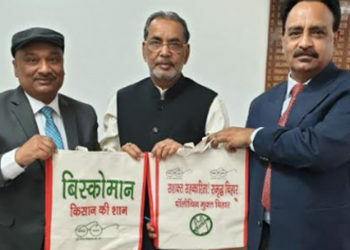 He along with the MD gave Union Minister a sample of eco-friendly bag.